Every Monday, I bring you a new Frappuccino of the Week. This week, the reader-submitted Frappuccino comes from Maegan in Michigan, who is both a coffee master and a Starbucks shift supervisor. I love this submission. My favorite yet. I’ve ordered it twice already. This special Frappuccino of the Week calls for the new milk chocolate sauce at Starbucks, being introduced into stores everywhere beginning April 28, 2015. It’s an ingredient in the S’mores Frappuccino sauce but the new milk chocolate sauce is so yummy. I hope – I mean this – that it sticks around for a long while at Starbucks! I’ve sent Maegan a $10 Starbucks Card from the Starbucks Reserve Roastery and Tasting Room as a thank you for her submission. I’m welcoming submissions for Frappuccino of the week! This has been a popular new category and so if I don’t respond to your submission right away, please don’t worry. Due to the volume of submissions, I can’t feature every Frappuccino idea that gets sent to me. Here’s how you submit a Frappuccino of the Week (if I use your submission, I’ll mail you a $10 Roastery Card as a thank you): First off, be sure to include a high resolution image of your drink. The Frappuccino should be full and not yet consumed. Include all information about the drink recipe or drink build. I want to make it easy for others to order your drink. 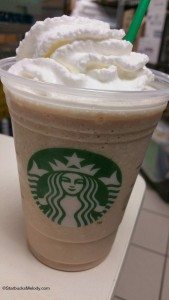 Include a statement that you took the photo of the Frappuccino and that you’re giving me permission to use it – entry into the Frappuccino of the Week category presumes that I may freely use your photograph on this site. Please introduce yourself and let me know if you are a customer or a partner. If you’re a partner, I’d love to know if you are a store manager, a coffee master, and/ or some small fun detail about your career – even your favorite coffee. Send your Frappuccino drink idea, image, drink build instructions, and all relevant information via email to Melody at StarbucksMelody dot com. If you want the $10 Starbucks card, I’ll need your mailing address. If you want to be a guest contributor on this Starbucks news site, I’d love to hear from you too! So it has vanilla bean powder+ 2 p WM + 3 p Milk choc? Am I correct in that, so that it is right? @Hayley – Yes. The cup would have VBF add 2 WM and 3 milk chocolate (I don’t know the cup code for milk chooclate yet. My favorite by far is the new smores frap. The managers have made me several for free the past couple weeks. Just love it. A frosty? From Starbucks? Count me in! Definitely will be giving this one a try!